BBC CoJo: What’s the difference between curation and journalism? BBC College of Journalism discusses a lively Twitter debate which took place at the weekend between Sky journalist Neal Mann and NPR’s social media strategist Andy Carvin. The blog attempts to move the debate on, looking at how journalism is changing as a result of social media. On Friday, ‘mainstream’ media made a bad mistake when it ran images of fighting in the Libyan town of Zawiyah – Reuters picked up the video from social media, which claimed/believed it was legitimate ‘today’ footage. Other news organisations then picked up the material and rebroadcast it until they discovered it was from fighting in exactly the same location but from the previous week. Was that a failure of mainstream media or social media? It was certainly a failure of journalism – and that’s the point: the differing strands of journalism and/or media are converging. This entry was posted in Editors' pick, Social media and blogging and tagged Andy Carvin, curation, Neal Mann on March 7, 2011 by Sarah Marshall. NPR’s On The Media show has Andy Carvin discussing how a ‘new kind of journalism’ has been created by social media reports from the Arab world. Carvin has been vetting sources and trying to verify individual tweets from the Middle East and North Africa since the recent uprisings began. Listen using the embedded player below. This entry was posted in Editors' pick, Social media and blogging and tagged Andy Carvin, NPR, On The Media, social media, Twitter on February 28, 2011 by Sarah Marshall. Mashable: Are social networks becoming personal news wires? To celebrate its five-year anniversary, Mashable is producing a series of posts on developments in social media. The latest looks at the impact of social networking on news consumption and the idea that social networks have become personal news wires. Following a discussion of online “friends” evolving into our news editors, writer Vadim Lavrusik rounds-up some interesting ideas about ways to measure source credibility in the future for greater transparency online. Though news is increasingly social and user-generated, the persistent fear is one of credibility and a flaw in measuring a curator’s knowledge on or interest in a topic. This problem could be improved by enabling users to develop more targeted news feeds on personalized topics of interest, but also by identifying specific sources and curators of information as more or less credible than others. One idea he discusses, put forward by Andy Carvin a senior strategist at NPR, would be to measure “who is knowledgeable” about a topic being shared. This could also include sifting sources based on whether they are eye-witness to an event or are experts on the topic, both of which add value in their own way, he said. Such a model could then help establish a credibility index among users as sources, helping consumers better decide what information is credible. This entry was posted in Business, Editors' pick, Online Journalism, Social media and blogging and tagged Andy Carvin, mashable, NPR, Online Journalism, online sources, personalised news, social networking, trust online, Vadim Lavrusik on August 11, 2010 by Rachel Bartlett. Via paidContent, we see that a live conference from the New York Times building is being webcast right now (not sure for how much longer), with a stellar line-up: Brian Stelter, media reporter & Media Decoder blogger, the New York Times (moderator) with Aron Pilhofer, editor, interactive news technology, the New York Times; Andy Carvin, senior social media strategist, National Public Radio; Amanda Michel, editor, distributed reporting, ProPublica; Jay Rosen, professor, New York University; and Joaquin Alvarado, senior VP, digital innovation, American Public Media. Live Webcast Happening Now: Crowdsourcing For Journalists, at NYT Building | paidContent. This entry was posted in Editors' pick, Events and tagged amanda michel, Andy Carvin, Aron Pilhofer, Brian Stelter, Jay Rosen, Joaquin Alvarado, propublica, the New York Times on February 5, 2010 by Judith Townend. 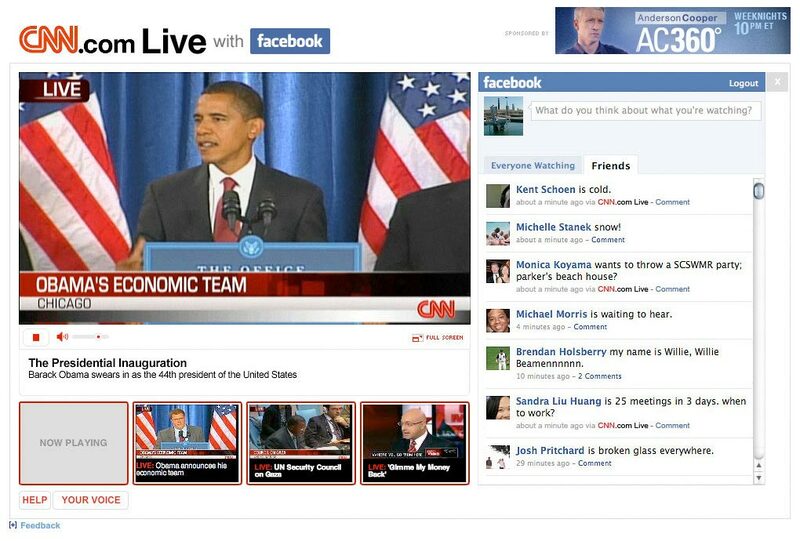 CNN’s going for the social networking angle, teaming its live video streaming site, CNN.com Live, with Facebook. 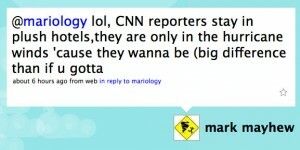 Users will be able to update their Facebook status from the CNN site and see a stream of updates from their friends. The updates entered via CNNLive will be tagged with the hyperlink ‘via CNN.com Live’ so Facebook contacts can click through to view the inauguration site from the social network. An inauguration #tag – for Twitter, Flickr, blog posts etc. The tag #inaug09 seems to be in use already. More help is wanted from techies and journalists – contact Andy Carvin (@acarvin on Twitter) via the blog post. This entry was posted in Social media and blogging and tagged #inaug09, Andy Carvin, Barack Obama, CNN, cnn.com, Elect Barack, Elect Barack Obama, Facebook, inauguration day, inauguration site, iPhone, live video streaming site, online coverage, President, social media ways, social network, social networking angle, Twitter, United States, us on January 9, 2009 by Laura Oliver. The winds have slowed down to a tropical storm, but the Gustav blogging continues. The mainstream media is reporting on the blogging phenomenon as well as the actual hurricane: the Chicago Tribune looks at the decision-making power of blogs and FollowTheMedia comments that the hurricane may stop print, but not the web. Meanwhile, over at Poynter, NPR’s Andy Carvin examines the role of social media in Gustav coverage. Pictures can be found easily on this Flickr search and over at gustavbloggers.com they reflect that it wasn’t as bad as they feared. Meanwhile, to prepare for reportage of the next natural disaster, the Blog Herald offers its disaster blogging tips. This entry was posted in Online Journalism and tagged Andy Carvin, blogging, blogs, Chicago, Chicago Tribune, Hurricane Gustav, location, mainstream media, media professionals, Roy Greenslade, social media, the Blog Herald, The Chicago Tribune, twitter local search, USA on September 2, 2008 by Judith Townend.